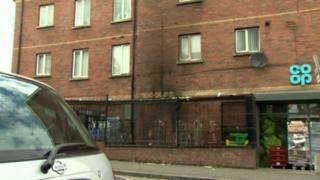 A shop on the Antrim Road in north Belfast has been damaged in an early morning arson attack. It happened about 7.55 BST on Sunday. A pile of rubbish was set alight at the side of the Co-op store. The shop sustained substantial damage to a caged area at the side of the property and scorch damage to a wall of the premises. Guttering and a number of windows of flats above the premises were also damaged. No-one was injured. A 23-year-old man has been arrested on suspicion of arson endangering life.